July 28, 2015 (Chesterfield, MO) – A Balsam fir Christmas Tree grown by Dave Vander Velden, of Whispering Pines Tree Farm in Oconto, WI, and a Douglas-fir Christmas tree grown by Jay and Glenn Bustard, of Bustard’s Christmas Trees in Lansdale, PA have been named Co-Grand Champions of the National Christmas Tree Association’s (NCTA) 2015 National Christmas Tree Contest. As growers of Grand Champion trees, each farm has earned the right to present the official White House Christmas Tree the next two seasons. Since 1966, NCTA members have presented the official Christmas Tree for display in the White House Blue Room. The 2015 National Tree Contest was held July 24 at the Richardson Adventure Farm in Spring Grove, IL in conjunction with a regional Christmas Tree grower’s conference hosted jointly by the MidAmerica Christmas Tree Association, the Wisconsin Christmas Tree Producers Association, the Indiana Christmas Tree Growers Association and the Illinois Christmas Tree Association. NCTA hosts the National Tree contest biennially and will not hold a national contest in 2016. The National Contest also anointed Co-Reserve Champions of the contest. Traditionally, the Reserve Champion farmers have provided a Christmas Tree for the residence of the Vice President. The Co-Reserve Champions are Charles Sturgill of Sturgill Tree Farms in West Jefferson, NC and Rex Korson of Korson’s Tree Farms in Sidney, MI. Sturgill placed second in the True fir category with a Fraser fir and Korson placed second in the spruce category with a Blue Spruce. Trees entered in the NCTA contest must fit into one of five species categories: True Fir, Douglas-fir, Spruce, Pine or Other. A panel of judges, made up of long-time growers and past contest winners, selected the first-, second- and third-place winners in each category, then attendees of the regional conference and a panel of consumer judges voted for their favorite among the species first and second place trees. 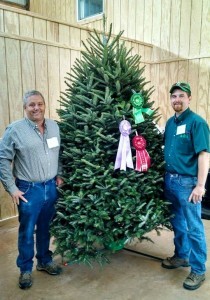 Those vote totals determined the Grand Champion and Reserve Champion trees. White House staff members typically travel to the Grand Champion’s farm in the fall to select the tree that will serve as the centerpiece of the Blue Room holiday decorations. The Blue Room tree will need be 18 ½ feet tall, much bigger than the 6- to 8-feet trees entered in the contest. About the National Christmas Tree Association (NCTA) The National Christmas Tree Association is the national trade association representing the farm-grown Christmas Tree industry. NCTA represents around 600 active member farms, 29 state and regional associations, and 4,000 affiliated businesses that grow and sell Christmas Trees or provide related supplies and services.